children and grandchildren. Summarized by Sandra I. Boehmler, a great-granddaughter, on 4-19-13. Herbert Edward Boehmler was born 03-20-1870 in Cedar Falls, Iowa. He died 02-03-1955 in Hampton, Iowa. H. E. Boehmler received his childhood education in Blackhawk County and became a pharmacist after graduating from Iowa State University. He was then employed as a chemist for the U.S. Government at Cedar Falls and was in charge of the production of the first sugar from sugar beets in Iowa. Herbert E. Boehmler moved to Hampton, IA in 1890 and for five or six years was a prescription clerk at the E. V. Baldwin Drug store. At that time pharmacies were also liquor stores. Family lore relates that Herbert E. Boehmler left the pharmacy business due to a desire by H.E. Boehmler or his new wife to not be part of the liquor trade. On 03-20-1895, in Hampton, IA, Herbert E. Boehmler married Ione Celestia Hutchins (b. 6-30-1873, Apple River, IL. & d. 2-11-1969, Hampton, IA). Ione was the daughter of Celestia Olivia Funk (b. 3-4-1847, on a farm in WI, near Apple River, IL, d. 12-16-1923, Hampton, IA, m. 12-15-1871, Apple River, IL) and Dr. James Henry Hutchins (b. 1-10-1845, Lockport, NY, d. 6-19-1912, Hampton, IA). Ione C. Hutchins Boehmler attended Rockford Girls’ School in Illinois for 2 years. She received a B.A. from Grinnell College in Iowa. Ione was artistic (paintings), played piano, did needlework, and was a member of PEO. In 1895, Herbert E. Boehmler bought the shoe store that was next to the drug store he had worked at in Hampton. His grandfather, George Henry Boehmler, Sr., had been a shoe maker in Strasburg, Alsace-Lorraine, (then in France, now in Germany), before moving in 1831 to Lyons, NY, and then in 1857 to Cedar Falls, IA where he continued as a shoemaker. H. E. Boehmler’s brother, Charles Albert Bemler, also made a living in the shoe business in Cedar Falls. The History of Franklin County states that Herbert E. Boehmler carried “a large and well assorted stock” of shoes and his business methods were “at all times honorable and his integrity was beyond question”. Upon the death of Herbert’s only daughter in 1922, he asked his son, Ronald Hutchins Boehmler, a clerk in the store, to take on more of the business responsibilities. Herbert retired from the shoe business in 1926, passing the store on to Ronald. In addition to the shoe business, H. E. Boehmler owned about one thousand acres of farming land in Franklin County. During the summer of 1915, Herbert had a large home built in Hampton, IA. It was classic example of Prairie School architecture and design principles and was designed by architect, Einar Groaten. The house was listed on the National Register of Historic Places in 1991 or early 1992 and is owned by a granddaughter of H.E. Boehmler, as of this writing in 2013. The home was and is treasured for its leaded art glass entrance door, varnished white oak, red oak, birch, gumwood, and pine woodwork and floors, 92 windows, central vacuum system, and intercom. As his grandchildren were growing up, this lovely home was the regular gathering place for Sunday dinners of H.E. Boehmler’s extended family. In Herbert E. Boehmler’s newspaper obituary, it was written that he “was one of the organizers and the first secretary of the Hampton Commercial Club” [which became] the Chamber of Commerce. He was chairman of the park board and served as a member of this group for many years. He served as president of the board of education for Hampton for six years and as treasurer and director of the Hampton Cemetery Association for many years. He was one of the organizers and charter members of the Hampton Country Club and was a charter member of the Hampton Rotary Club, having served as president of both organizations. He was a director of the First National Bank since its organization and served as chairman of the board. Mr. Boehmler was an active member of the Congregational Church and served as all of the various offices of the church and had been named a life deacon. Hampton’s beautiful cemetery and city parks are a tribute to Mr. Boehmler as he spent many years devoting untold effort to their development and beautification. Herbert E. Boehmler was the son of George H. Boehmler, Jr. (b. 08-19-1837 in Lyons, NY, d. 07-19-1907 in Cedar Falls, IA) and Elizabeth Seligman (b. 03-23-1839 in Lyons, NY, d. 08-06-1884) who married in Lyons, NY on 10-20-1856. Herbert E. Boehmler’s parents were Iowan pioneers, moving to Cedar Falls, IA in 1857. During their early years in Cedar Falls they dealt with all the struggles and difficulties of frontier life. George H. Boehmler, Jr. was in the lumber and grain industry and established the first elevator in Cedar Falls. Herbert E. Boehmler was the fourth of five children. His siblings were George S. (b. 1857 in Lyons, NY, d. 4-14-1937, married and lived in Saskatchewan, Canada and Seattle, WA), Charles Albert Bemler, (b. 1859, d. 1937, both in Cedar Falls, IA, m. 1889 to Katherine Sheridan, changed the spelling of his last name, a claim adjuster for the Chicago, Milwaukee and St. Paul RR at Cedar Falls), Harry Clinton (b. 11-18-1865, d. 4-5-1943, m. Ida Abel, in Waterloo, IA in 9-1900, engineer on the Illinois Central RR at Waterloo), and Carrie M. (m. J.P. Harmon, lived in De Moines, IA, d. July, 1939). Herbert and Ione Boehmler had 3 children: Ronald Hutchins Boehmler (b. 12-06-1897 in Hampton, IA, d. 03-17-1995, in Hampton, IA. ), James Herbert Boehmler (b. 07-10-1900 in Hampton, IA, d. 06-28-1984, in Hampton, IA), and Gwendolyn (b. 12-11-1911 in Hampton, IA, d. 02-17-1922 of diabetes in Hampton, IA). Ronald H. Boehmler received his B.A. from Grinnell College where he was a star pole vaulter on the track team. He married another Grinnell graduate, Mabel Evans (b. 02-03-1897, Albia, IA), on 3-26-1922. Ronald made his living running the shoe store in Hampton, IA. He and Mable had 3 children, all born in Hampton: William Harris (n. 03-19-1924, d. yr unknown to this writer, but around the early 2000’s), Joyce Ione (n. 09-07-1926), and Barbara (n. 02-02-1937). It was Barbara who originally compiled the information included in this biography. 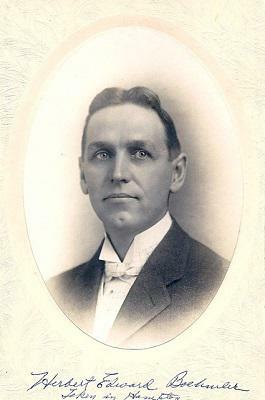 James H. Boehmler attended Grinnell College for 1 year and Iowa State U for 2 years. He farmed 1 mile outside of Hampton, IA from 1920-1976, where he bred Holsteins and ran a dairy business. He was the farm manager until 1983. He worked at the Hampton 1st National Bank, starting as a clerk in 1930 and rising to be a Vice-President. On 12-15-1920, James H. married Bessie Luke (b. 1-14-01, Hampton, IA, d. 2-18-25 from infection following child birth). James H. and Bessie L. had two sons, James Herbert, II (b. 2-23-1923, Hampton) and Barton Luke (b. 2-11-25, Hampton, d. June or July, 2008, Hampton). On 10-23-1925, James H. married Eloise Beula Tebay (b. 6-25-1900 Iowa Falls, d. 10-16-57, Hampton, IA). James H. and Eloise had two sons, Richard McDowell (b. 11-29-26) and Robert Hutchins (b. 7-20-30). Richard M.’s daughter Sandra Ione Boehmler has summarized this biography of Herbert E. Boehmler. On 3-22-58 in Eugene, OR, James H. Boehmler married Ellen Evans (b. 2-22-1898, Maxwell, ID). They lived in Hampton, IA until their divorce in 1971. On 3-5-72 in Montgomery City, MO (where his son, Robert, lived), James H. married Cynthia Starbuck (d. 2-1983 in Hampton). Ten year-old Gwendolyn was taken to the Mayo Clinic for treatment of juvenile diabetes. The doctors offered to give her a new experimental treatment for diabetes. Ione H. Boehmler did not want her daughter experimented upon, so the treatment was declined. Tragically, the new experimental treatment was the injection of insulin. It became an accepted treatment 6 months after Gwendolyn’s death. Beloved Gwendolyn’s death brought such sorrow to her mother, Ione, that her bed room was left as it was when she died, and it remained that way through the entire lives of Herbert E. and Ione H. Boehmler. Herbert E. Boehmler’s descendants live in Iowa, Montana, Connecticut, Florida and many states in between. His values of prudence, integrity, and public-mindedness have been passed down through the generations. The photo (below) is of Herbert E. Boehmler as a young man. There is additional information about him on the Franklin co. IAGenWeb site. Use the search box on the main page to locate the data.